Welcome to our blog! Here, we will be posting information about special events we have coming up, as well as food and drink pairings, dishes of the month, and what makes Revel Restaurant one of the best restaurants with private rooms in Garden City, NY. From bar bites and adult beverages to weekend brunch, lunch, dinner, and delicious three-course meals, we have it all, and we regularly take reservations for large parties in our private dining room. In fact, we are proud to be a local hotspot for corporate dinners, medical and pharmaceutical events, holiday parties, graduation celebrations, baby showers, and more. That being said, here is a little more information about us! Revel Restaurant is an upscale urban restaurant that serves up delicious Italian cuisine, hearty American meals, and the best seafood in Garden City, hands down. 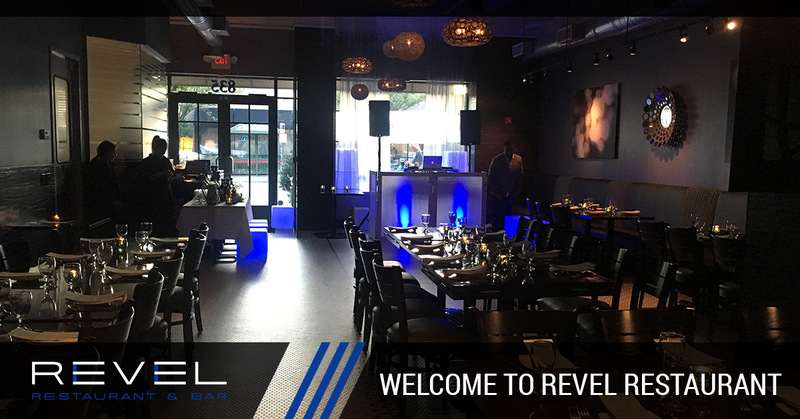 People from all over Long Island and Nassau County flock to Revel Restaurant to enjoy our unique, handcrafted dishes made with fresh ingredients, making us one of the most popular restaurants for group events, milestone celebrations, and holiday parties alike. Whether you are looking to host an event at Revel Restaurant or are looking for the best caterer in Garden City, you’ve come to the right place! At Revel Restaurant, we frequently host corporate events and group celebrations in our closed-off private dining area, which can be reserved for any large party so you get an exclusive dining experience that is uninterrupted by other tables. From bridal showers, graduation parties, and retirement celebrations to corporate events, pharmaceutical staff dinners, and company holiday parties, we welcome any group to enjoy a private dining experience in our restaurant event space. Known as one of the best restaurants with banquet rooms in the area, the staff at our upscale restaurant is skilled and experienced in waiting on large groups, whether that means serving up extravagant three-course meals, preparing a buffet-style banquet, or shaking up delicious cocktails for our guests. In addition to hosting corporate events, large parties, and group dinners in our private dining room, we are also known for our delectable meals and unforgettable service. With a wide selection of seafood, steaks, pasta dishes, and more, there is something for everyone at our sophisticated restaurant in the heart of Garden City. And, if you have a hard time deciding on just one dinner entree, our team would be happy to provide a recommendation or point you to one of our delicious three-course meals so you get the best of all worlds. Our service to you is of the utmost importance here at Revel Restaurant, so we do everything in our power to give you the best private dining experience possible! When you reserve a party at our restaurant with private rooms for group events, you can rest assured that your party will be well taken care of. Before your party arrives, our staff will set the tables, prep the bar, and get any preliminary requests taken care of, such as shareable appetizers or pitchers of ice water. Group events are our specialty, so don’t be afraid to ask for any accommodations your party would enjoy upon their arrival. Ready to book your special event or corporate dinner at Revel Restaurant? View our menus and gallery online to plan your event with us, and book your reservation today!